Contains one or more subdiagrams, or cases, of which only the Enabled subdiagram executes. Use the Disable Structure to disable a section of the diagram. 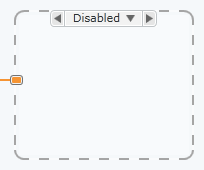 You can conditionally disable subdiagrams using the Edit Condition for Active Subdiagram button on the Item tab.